We’ve got two links to the tall Irishman today, one from the man himself. O’Brien got Jean, Reiss, Jay Kogen and Jeff Martin to sit down and talk about the show. The link we have is just the preview, but the whole thing will be up on Monday. The other O’Brien link is a look back at his various career stops on account of the whole getting-dumped-for-Leno-and-now-Fallon thing. In addition to that, we’ve also got a Ringo link, a whole bunch of direct and indirect usage, a “First Annual” chili cook off (sort of), a couple of lists, and Australian comic, and some really cool fake ancient art. The first series of Simpsons Illustrated comics were published between 1991 and 1993, and read half as a fan magazine, and half as a publication within the Simpsons universe, including mock advertisements, news articles and fake products. Heh. Wish I’d read that in 1991. Preview: "The Simpsons" Writers Reunion – Want to watch. After unknowingly purchasing fake pre-Colombian artifacts, artist Nadín Ospina gave serious thought to Latin-American culture and its ancient roots. His sculptures depicts pop-culture cartoon characters such as Snoopy, Micky Mouse, and Bart Simpson in an often pre-Colombian style. Click through for some examples. The Bart one is great. Best. Episode. Ever. (Round 4) – Now this is an ambitious Simpsons blogging project. The author has set up a bracket of 256 episodes, and is running them down one matchup at a time. With that many episodes there’s bound to be some Zombie Simpsons, but a quick glance at the bracket reveals that the overwhelming majority of them are non-Zombie Simpsons. Assuming this continues, I’ll be checking in regularly. The Gallery: Iconic Pop Culture Maps – They’ve got pretty maps for everything from Gotham to Zelda to Springfield. Fox could become cable channel, News Corp. COO Chase Carey says – This story was bouncing around all week because a tiny company almost no one uses is theoretically threatening the cable money that FOX gets, which caused Murdoch’s right hand man to make a petulant remark. Ignore it. The cable bubble will pop on its own. There’s an episode of The Simpsons in which Lisa, insecure about being beaten to first place in a saxophone competion by a better player, has a dream about being in a band. They take the stage to the announcement ‘Will you welcome Garfunkel, Messina, Oates, and Lisa singing their number two hit, Born to Runner-Up.’ It’s hard not to conjur this scene when watching Ringo at the Ryman, a concert filmed at Nashville’s famous auditorium. The All Starr Band, here in it’s twelfth incarnation and twenty third year, pull out all the stops to celebrate another milestone – the birthday of the Ringomaster of this very perculiar circus. But has anyone ever bought tickets just to boo him? Roger Ebert’s Many Loving Parodies: ‘The Critic,’ ‘The Simpsons,’ ‘Godzilla,’ and More – Some very good YouTube here. Remember that episode of The Simpsons where Homer has to coat his mouth with wax in order to withstand some really hot chili peppers? That should help you prep for New York City’s first-ever Hot Sauce Expo, which will go down at East River Park in Williamsburg, Brooklyn on April 20. Drinking candle wax is still probably a bad idea, though. While it’s difficult to tell from this vantage point whether they will consume all publishing outlets or merely enslave them, one thing is for certain — there is no stopping them. Amazon will soon be here. And I, for one, welcome our new ebook overlords. I’d like to remind them that as a top 10 best seller, I can be helpful in rounding up others to toil in their Kindle Direct Publishing program. Sometimes it feels like Madison has a bit of Lisa Simpson in it. Part of her self-worth (yes, we know she’s a cartoon) comes from the thoughts others have of her, and it’s no less true of Madison (or more specifically, Madisonians). "Grade me! Look at me! Evaluate and rank me!," Lisa said in one episode when she wasn’t being analyzed by her teachers. Lest anyone think movie box-office is a zero sum game, it was good news all around this weekend for studio and independent films alike. To paraphrase The Simpsons: “In a way, you’re all winners. But in another, more accurate way, Evil Dead is the winner.” With $26 million against a $17 million budget, the remake of Sam Raimi’s cult classic proved that its possible to open a movie without Bruce Campbell and still be successful. The horrifying of a stranger is a lot like a good marriage . . . Just shut up and eat the damned orange! The Simpsons Tapped Out: Pre-Whacking Day Day – There’s a Whacking Day update to the new merchandising cash cow, and it came out yesterday, a full month before the actual Whacking Day on May 10th. I don’t know if they care or if this particular piece of content ends then, but it seemed worth noting. Top Ten Pet Owners- A Mexican Standoff – Cat Lady makes the list here. Also, well done for including Woody Harrelson from Seven Psychopaths. Hey Marge, look at this… – A YouTube heavy Family Guy comparison. 5. If all else fails, quote the Simpsons. Hey, that’s what we do! Doctor Who: The Happiness Patrol…In 10 Words – Happy thoughts. Happy thoughts. Spies of Warsaw…In 10 Words – I heard how this ends, it turns out the secret code is the nursery rhyme he told his daughter. Facebook Home…In 10 Words – Don’t let the haircut fool you, he’s exceedingly wealthy. One Face;Different Forms Haha xD – The same face drawn in eight different styles, including Muppet, South Park and Simpsons. There are so many Itchy’s – A comedian in Australia went on tour and had medical students tell her about nanobots. This is a video of her describing what she learned, and around the 2:00 mark it goes all “Itchy & Scratchy Land”. Poll Results: Best Cartoon Series – It was close, but the show won the best cartoon series vote here, narrowly edging Looney Tunes. April 8 – Grumpy Old Man – It’s a blog about drinking that links to some famous cranky old men of television. The Simpsons gets two, Burns and Grampa, plus there’s bourbon. Tell Simpson I’m ready to deal! 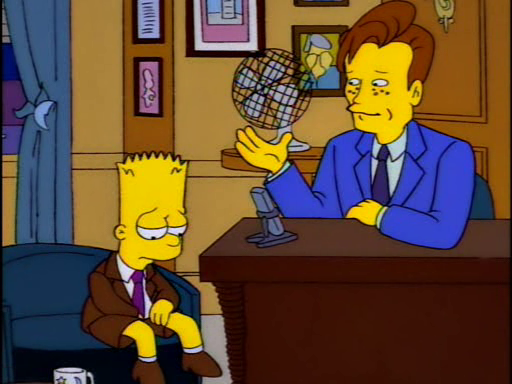 In other news, I’m watching The Simpsons while trying to edit my last major research essay. Once it’s all done and handed in this Monday, I’ll talk more about it here. I’m watching 4×04 where Lisa becomes Little Miss Springfield after the original winner is struck by lightning. Lisa walks around with the electrocuted tiara for the remainder of the episode. I guess those kind people at Laramie couldn’t fundraise for a new one! Menthol Moose’s medical bills are outrageous. Bureau Of Regrettable Ideas Case File #36: The Simpsons, The Yellow Album – The A.V. Club on the second CD FOX used to cash in on Bartmania . . . in 1998. Homer and Marge Simpson: Greatest TV couple ever – The staff at EW.com have decided that Homer and Marge are the best TV couple. That is all. 20 TV Characters Who Deserve Their Own Spin-Off – This is useless click bait, one entry per pageview (bastards), but I linked to Frink at #5, in case you’re interested. As writer and producer for the series between 1991 and 1993, O’Brien scripted some of the most undisputedly superb episodes the show has seen in its 24 years on the air (and, let’s face it, will ever see). Gracias for the shout-out. Y super-gracias a Goya! Thanks for posting the link. And everything’s better with bourbon! Love Conan, and goodreads, too. Homer is awesome! Also: Mike, if you ar reading this, please check out this tumblr blog: http://thesimpsonsaday.tumblr.com/ and thanks, Mr. Amato. as the episode will get. Thanks for the reference, guys! No list of cranky, old men from television is complete without the definitive one: Archie Bunker! Archie Bunker was Abraham Simpson 15 years early: A bitter, racist, hilarious old man whose show was the most irreverent, thoughtful and offensive of its time. Colonel Potter was also a great old man character from a similar show around the same time, but he was not much like Grandpa Simpson. Archie Bunker and Colonel Potter in 10 words: We outsmarted [Colonel Potter,] and he outsmarted you! Ha ha!